The history of Hebden Bridge is fascinating and moving. It was our Pennine hills and valleys which powered the mills and factories of the first Industrial Revolution - the overgrown ruins of these old mills can still be seen in many of our valleys.The 19th century saw the roots of the coop movement. In the middle of the 20th century came the asbestos tragedy. How the hippies shaped Hebden Bridge: Report of the talk given by Chris Ratcliffe and Jenny Slaughter to a packed meeting of the Hebden Bridge Local History Society, telling of communal living, revolutionary politics, alternative lifestyles and more. 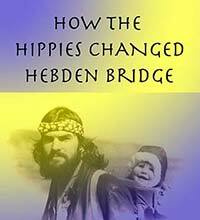 How the Hippies Changed Hebden Bridge: An exhibition organised by the Local History Society aims to show how those who moved into our area in the 1970s - the locals called them 'hippies' - kick-started the cultural renaissance which is today so Hebden Bridge. Read more. Paul Kenny, by profession a signal-man (including at Hebden Bridge) is also a keen photographer, and shared slides and his stories with the Local History Society. The Lost Kingdom of Elmet: Local History Society meeting report with speaker Dave Weldrake who used evidence from place names and archaeology to illuminate this lost kingdom from the Celtic twilight. Read more 1 Nov 2015. 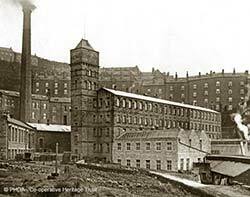 When the Nutclough Mill was a co-op, it hosted an annual series of lectures, given by Oxford University dons and others on history, politics, literature and science - report from the local History Society. Memories of past times. Boarding at a Pecket Well farm, Peter Kelly taught at Calder High from 1958 to 1961, and has sent the Hebden Bridge Web some of his memories. Dozens of newly arrived homeless people squatted a large Hebden Bridge terrace - Queens Terrace. 30 years ago, both Hebden Royd and the newly Conservative Calderdale Council, decided they should be evicted.